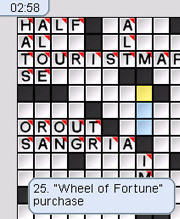 Ottawa – The New York Times  launched today a new crossword application for the Apple iPhone and iPod touch models. Developed by Ottawa’s Magmic Games , the crossword application is designed to closely mirror the print crossword experience, with a simple user interface and three different puzzle views. It features the daily puzzle from the newspaper, 30 classic puzzles edited by Will Shortz, crossword editor, The New York Times, and an archive of more than 4,000 puzzles. The New York Times crossword application is available for a one-time cost of $9.99 through the Apple App Store . Magmic is also developing a NY Times version of Sudoku.